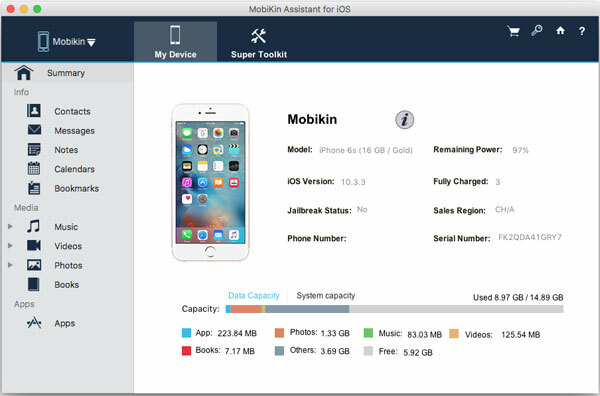 MobiKin Assistant for iOS (Free Mac version) is one of the best free iOS Assistant software for Mac users. With it, you can backup the data from iPad, iPhone or iPod to Mac computer for management easily. People always wish to transfer data from iDevice to desktop disk for backup or other purposes. 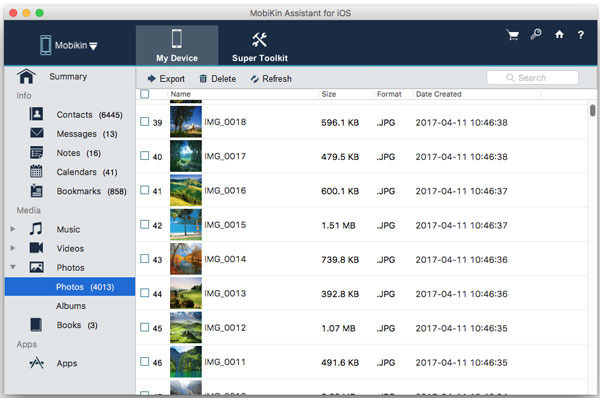 So as the best iOS Assistant for Mac freeware, MobiKin allows you to transfer more than 10 types of files to Mac computer with 1 simple click. And it also allows you to restore the exported files from Mac to iPhone, iPad or iPod easily. Media Files Contacts, Messages, Notes, Calendars, Bookmarks, Photos, Movies, Music, TV shows, Podcasts, Audiobooks, Books, Playlists, Ringtones, Voice Memos, Camera Roll. 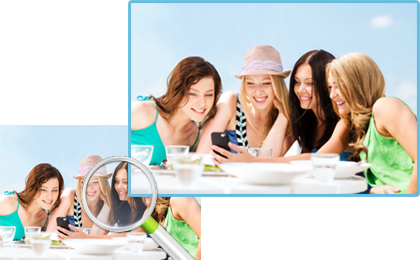 The exported data will be saved in its original file format and quality. Thumbnail View Mode: The catalog in your iDevice will be displayed as a table of thumbnail images in adjustable sizes. So that you can browse your desired files more intuitive. List View Mode: Files under this mode will be shown with its detailed information, including name, file size, type, time, etc. 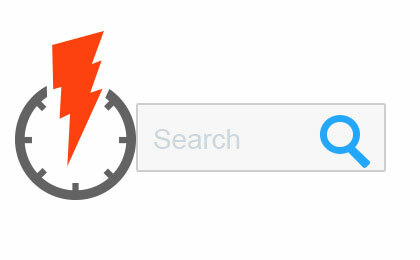 How to quickly locate your target files among thousands of files on the device have become a big headache for lots of iDevice users. So MobiKin have taken your problem into consideration and release this program to provide you with a quick way to find your target files. Directly type one or two keywords in the searching box on the top menu, you can directly get the file you need at seconds. Preview files according to the file type, it can greatly reduce the difficult to find the file you wish to backup on the Mac. 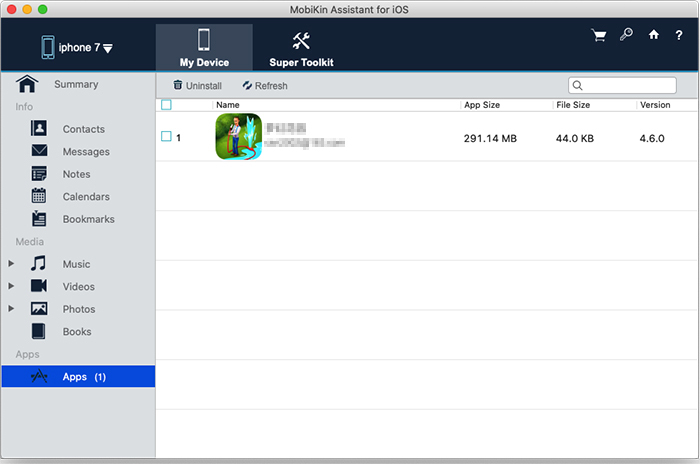 Users of MobiKin Assistant for iOS (Free Mac Version) Have Surpassed 740,000+ Worldwide. First of all, you have to click the below icon to get and install the software on your Mac computer. Then, you need to click the "Get License" icon on the top page to get a free license. After that, you can follow the below steps to manage your iOS data easily. Here, we also provide you with the Windows version. After that, you need to ensure the iTunes is also installed on the Mac. But if your iDeivce is linked to the Mac computer via its USB cable, then you can check the detailed information like the storage space, serial number, etc. in the main interface as you like. Note: To ensure your iDevice will be recognized by the program, you need to click "Trust" on your iDevice. And you need to register the program with the license code you have received in this page. See how to register MobiKin software. When your device is successfully detected by the program, then you can find that all data on your device have been managed in a tree style. To find your needed files, you can enter these different folders and go through them one by one as you like, or you can directly type the file name in the searching box to locate the data you want immediately. Step 2. Here, we'll take the Contacts info as an example to show you how to manage it with this Assistant for iOS easily. - Tick the contacts you wish to backup or export, then select "Export" button on the top menu. Then, you can get 3 different output options like CSV, VCF or XML. Just choose one of them, then wait for the end of the process. - To import contacts backups from PC to iDevice, you can directly choose "Import" button to locate the source file and sync them to your iPhone or iPad as you like. At present, this program only support source files in XML format. How to Backup or Export Media Files from iOS Devices to Mac? Step 1. Connect your iPhone, iPad or iPod to Mac computer, then click "Trust" on your iDevice to make your device be recognized by the program. Step 2. Click the category of "Photos", "Music", "Videos" in the left panel, and choose the sub category like "Ringtones", "Voice Memos", "Music", "TV shows", "Movies", "Albums", etc. as you like. Step 3. Select and tick all files you wish to export, and click "Export" button to choose an output folder to save these files. How to Uninstall Apps from iPhone, iPad or iPod touch on Mac? Step 1. Link Your iPhone, iPad or iPod to Mac computer and make the program be detected by the program. Step 2. Directly choose "Apps" in the left panel, and you can preview all apps in the program. Step 3. Tick the apps that you want to remove, and click "Uninstall" button to delete it soon. How to Manage (Backup, Restore, Delete, etc.) iTunes Backups on Mac? To manage iTunes backups on Mac, you need to enter "Super Toolkit" area. Click "iTunes Backup & Restore", then you can see an interface like below and start your iTunes managing process right now. Click "Backup" button on the top menu, then a new pop-up window will appear on your Mac as follows. Here, you can decide and select the device you wish to backup, and choose an output folder according to your own needs. After that, just hit "OK" button to begin the backing up process. Hit "Restore" option on the top menu, then you can see an interface like below. Confirm the target device and choose one of the iTunes backups for restoring. After that, click "OK" button to begin the process. If you want to remove some unnecessary backups from iTunes locations, you can directly choose the backup and hit "Delete" button to remove them right now. - Added the authorization settings prompt when loading iTunes backup on macOS 10.14. - Fixed the issue that importing ePub format eBook may fail. - Support to manage iTunes backups on Mac directly. 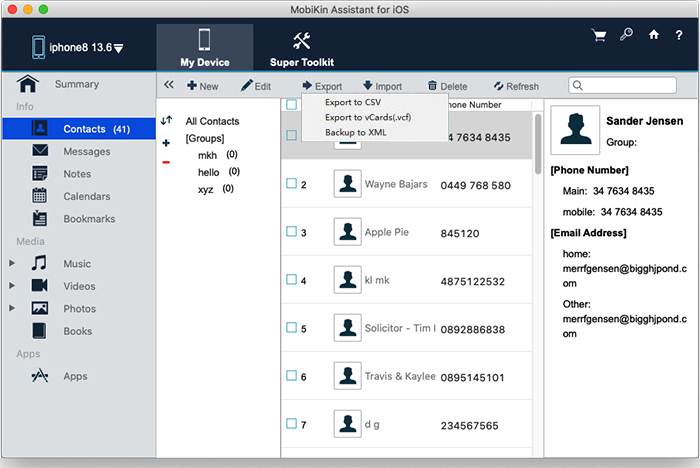 - All-new free version of MobiKin Assistant for iOS (Mac).